From 23rd to 25th August 2004, representatives of governments of Korea and Japan met in Kyungjoo, Korea, for their fifth session of Korea-Japan Free Trade Agreement (hereunder, KJFTA) negotiations. Various social movement organizations including KoPA, Korean People’s Solidarity and others held a press conference in front of Hyundai Hotel, situated in a resort area in the morning of 23rd August. The KCTU then held a demonstration in which 800 workers participated. Amidst clashes with the police that had surrounded the hotel, representatives of organizations delivered a protest letter to a Korean negotiator from Ministry of Foreign Affairs and made our demands clear. The governments of Korea and Japan have come together today, 350km away from Seoul, for their fifth negotiation to consolidate a free trade agreement (FTA) between the two countries. Ever since the negotiations were initiated last December, many NGOs and people’s organizations have shown concern over the planned FTA. However, the two governments, during the previous negotiation confirmed that they will strive for a "comprehensive and meaningful FTA", and then during the Korea-Japan Summit of 22nd July held on Jeju Island, resolved to "make joint efforts to establish an environment in order to facilitate the FTA". Now, during this fifth negotiation, the two governments plan to discuss the ’integrated text’ for the FTA, without consultation, in a secretive manner. Whether through the WTO or FTA, the neoliberal ’free trade’ regime, which allows maximum freedom only for transnational capital, translates into destruction of lives of the people. This reality was brought to light during the recently consolidated Korea-Chile FTA, confirmed through the Doha Development Agenda(DDA) negotiations of the WTO, and reaffirmed through the KJFTA negotiations. We are already experiencing the destructiveness of free trade agreements. The Korea-Chile FTA that was signed last year has brought about destruction of farming households, forcing peasants to give up farming. The 2.5 million farmers are expected to decrease to a mere 400,000, while the peasants who have been displaced from their lands flood to the cities to become irregular workers - much to the joy of capital. Why are the two governments negotiating the FTA in face of this reality? The FTA is a policy to further flexibilize the labour market. It will enforce restructuring, perpetuate job insecurity and increase irregular work. During the negotiations, the Japanese side identified various laws and measures that protect basic rights of workers to be ’non-tariff trade barriers’ and demanded abolition of these regulations. Recently, the Seoul Japan Club - organization of Japanese corporations in Korea - submitted to the Korean government a list of 13 regulations on labour they would like to see lifted. The list included decreasing the number of paid full-time trade union officials, severe punishment of illegal industrial action and facilitation in lay-offs. 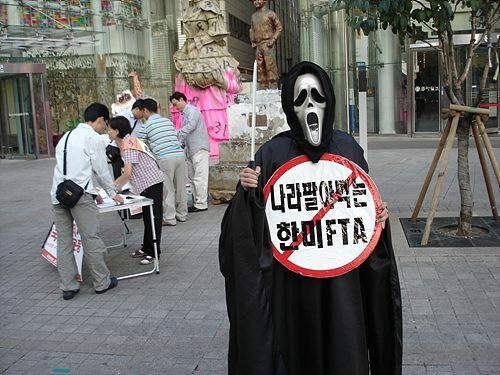 If these demands are included in the FTA under the name of ’non-tariff measures’ (already deregulation of six labour-related measures are included in the KJFTA joint report, which forms the basis of the agreement), workers’ lives will be devastated. Also, the two governments are planning to introduce ’mutual recognition’, which will deprive opportunities to check the safety of foods and medicines, under the name of ’trade facilitation’. In addition, the KJFTA is expected to include clauses that will guarantee speculation under the false labelling of ’investment’, and clauses on intellectual property rights that will limit people’s access to medicines and information. The KJFTA will also, of course, include "comprehensive and meaningful" liberalization of services, leading to further privatization and degradation of public services. As many researchers have already mentioned, should the KJFTA be consolidated, it will have serious repercussions for Korea, with its relatively higher rate of tariffs. It is particularly expected to hit the heavy industry, including automobiles and machinery. Even the reports from government and its affiliated research institutions warn of increased trade deficit against Japan. Japanese capital will cry with joy at the increased exports into Korea, while Korean companies will take the opportunity to strengthen restructuring and lay off workers. Furthermore, market integration with an economy that is nine times the size of Korean economy will deepen economic subordination. The Korean government says it will be able to compensation for the losses through FTAs with China, ASEAN or South America, however, we know that this is nothing more than mere rhetoric. The government justifies the FTAs by saying that ’free trade is an irrevocable trend’, that they are the only ways in which Korea can survive. However, the global resistance against WTO, regional and bilateral FTAs prove that ’free trade’ is not an ’irrevocable trend’. It has also been proven in various places around the world that more FTAs mean more dependency of Korean economy to the global market and thus more vulnerability to economic crises. We reiterate that the KJFTA will bring only misery and destruction to the whole society, and we demand the governments of Japan and Korea to immediately stop the negotiations. If the governments ignore our call and carry on the negotiations, our struggles against the KJFTA will all the more become stronger. — Stop the secretive negotiations and disclose all the texts! — Stop the KJFTA negotiations, which will infringe labour rights and destroy public services! — Peoples around the world are demanding: Stop WTO that kills farmers and workers! Stop DDA negotiations!